A skin disease is often rooted deeply in various underlying tissues like fat, blood and muscles. Most skin therapies are only external applications like creams or oils and addressing the localised inflammation and/ or irritation. However, these never touch the root of the problem and thereby, the traits vanish temporarily, and the disease is not rooted out permanently. 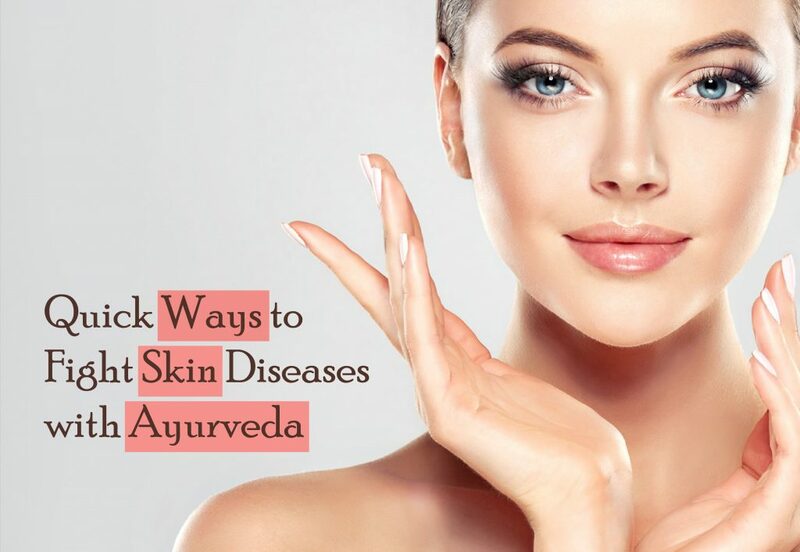 Ayurveda says that the skin has six layers, from epidermis to subcutaneous tissue and identifies 18 types of pathologies for skin disease (known as Kushta) according to the doshas involved and the layers and regions of the skin affected. What Causes a Skin Problem? Poor metabolism and accumulation of toxins: Poor metabolism failing to eliminate waste from the system timely result in the accumulation of unwanted materials in the body. As the skin provides a lot of space of for the sedimentation of toxins from blood, gets irritated and loses it’s health leading to diseases. Stress: As Stress can cause hormonal imbalances, which may trigger or intensify skin diseases. Many of our nerve endings connect to our skin and other organs. When we experience emotions, they can play out on our skin. Unhealthy diet: Proper nourishment is important to maintain health and prevent skin diseases. On top of that Ayurveda discusses in details about incompatible food combinations that can affect the digestion and/ or result into the accumulation of toxins in the system. Weakened immune system: result into the infection of the skin. Fungus, parasites, or microorganisms living on the skin, greatly influence in the severity of the disease. Dry skin: When skin becomes dry, it can easily be affected by numerous external and internal factors, resulting into itching, rashes and skin diseases. Skin conditions have a wide range of symptoms. Conditions that irritate skin can cause symptoms such as burning, swelling, redness, and itching. Acne can affect appearance and confidence. Infections on the skin can be painful or itchy. Skin irregularities such as red/white bumps, scaly/rough skin, rashes, ulcers, open sores, cracked skin, oozing, discharge, discolourations, etc also develop with skin diseases. Ayurveda advices not to take certain foods together as it makes digestion difficult or slow, resulting into the formation of unwanted byproducts, mucous and / or indigestion leading into accumulation of waste. Frequent use of incompatible food combinations can cause chronic and serious skin diseases. A few examples of incompatible food combinations are (known as virudha-ahara in Ayurveda) mixing hot and cold foods together, mixing a number of proteins together, mixing opposite flavours together (for eg: sweet and sour, milk with sour fruits- we know it can spoil milk), making weird combinations like fish with cow’s milk, heating honey, taking yogurt at night, etc. Excessive amounts of meals and fluids slows down digestion and metabolism resulting into accumulation of toxins. Slow digestion becomes a special concern if you are suffering from skin disease. Key to health is ensuring proper digestion of whatever you are eating. So always eat when you are hungry and drink when you are thirsty and remember to go with the portion size you can digest quickly without any uneasiness. (If you don’t feel hungry or thirsty, you need help to correct that first!). You can include ingredients such as peppermint, ginger, fennel, and turmeric in your diet, which are great for digestion and overall health. It imbalanced your pitta and increases heat and acidity in the system. So to keep it cool, make sure you’re drinking plenty of water. Calls of nature are strong neuronal actions where whole body is involved. So messing up with them is is harmful to your health and wellness. When you suppress your natural urges, it may interfere with the balanced state of Vata Dosha. Among them suppressing bowel movements and vomiting is especially harmful for skin as the body stores toxins/wastes in your skin if you prevent their normal elimination. You need the help of an expert here. Generally it is recommended to avoid hot, acidic and dry foods in skin diseases. Chillies, tea, coffee, alcohol, hot and spicy food, pickles, salted foods, sour fruits, tomato, eggplant, chick peas, black grams, to name a few. Bitter flavour is highly recommended in skin as it helps to detox and clear liver and skin. – Treatment of skin diseases need a multifaceted approach.. Various therapies are available in Ayurveda which would be chosen by an expert according to the causes, stage of the disease and symptoms. Abhyanga: Abhyanga is Ayurvedic warm oil massage therapy using specific strokes. When administered with the right herbalised oil, it helps to balance doshas, reduce allergic response, address dryness and improve lubrication and immunity. Takradhara: A variety of shirodhara (streaming of warm oil on forehead at third eye) where herbalised buttermilk is used. Takradhara is a therapy evolved in the wisdom of Kerala Ayurveda and is administered to control allergic response, itching, rashes and so on. This is a wonderful therapy that helps to get a control over the disease in many cases. Panchakarma: Ayurvedic detox treatments that helps to cleanse the body and mind. Read more about Panchakarma here. Herbal combinations: Various herbal combinations are in available in Ayurveda which can be used to improve digestion and metabolism, reduce stress, inflammatory response and allergic response and to improve immunity in skin diseases. Neem, khadira, Aloe Vera, Brahmi, Triphala, Coconut oil, Sesame oil, ghee to name a few. Natural drugs from plants are winning popularity because of numerous advantages such as better patient tolerance, often having fewer side-effects, relatively less expensive and time tested.